Ten years ago, I asked Cell companies to let me have more than one phone on the same number. Recently I noticed the ability to almost do that with Google Project FI cell service. Everywhere I go, a vast majority of people seem to now have two things in associating with their phone -- a protective case, and a spare USB charging battery. The battery is there because most phones stopped having switchable batteries some time ago. The cases are there partly for decoration, but mostly because anybody who has dropped a phone and cracked the screen (or worse, the digitizer) doesn't want to do it again -- and a lot of people have done it. Back from 5 weeks of international travel, I continue to seek the best solution in my quest for reasonably priced data service when outside the USA. Data has become a must for me when on the road. In spite of the fact that we all lived without it a decade ago, I find it very frustrating if it's not available (or priced at $15,000 per gigabyte, which is the typical default roaming rate.) It's how I find directions, food, tourist info and keep in touch with others. For a while my normal practice, if in a country for more than a few days, has been to purchase a local SIM card, and of course to have an unlocked GSM phone. Usually local SIMs are now available with 500mb to 1gb of data for $10 to $20. There are various web sites that list the local data providers to help you choose. The best prices tend to come from the MVNOs -- not the main incumbent carriers -- but even the big carriers tend to have decent prepaid deals. These usually come with some voice minutes and texting. This is useful though I don't do a lot of voice minutes when overseas due to time zones. I use them to reach local friends, book hotels, check restaurants, and with my companion. Annoyingly, though I have bought many of these SIMs, even for data, it's not nearly as nice and easy as it should be. A large fraction of the time, something goes wrong. It can often be a pain to research and pick the right carrier, and then to find one of their stores, and get the purchase done. This was particularly true in the past, when selling a SIM to a random foreigner was not a common event at many stores. You have to go out of your way, and deal with people who don't speak your language. Some providers put a store in the arrival area of the airport, which is great, though they tend to be the more expensive cards. Until you get the new SIM, you are faced with very expensive roaming. Research does matter. In England (where language is not a problem) some carriers give you your data bundle free when you put 10 pounds on the card, others charge you those 10 pounds, leaving you with no voice minutes. Once you get the card, you often have to deal with web sites, menus and voice prompts not in your language. Setting up the voicemail is already a pain, and is far worse if you can't understand the prompts. Fixing odd problems is difficult in an unfamiliar system. My Orange card had a package of 500mb in it for 10 Euros, (great) but kept draining the money I put on it, leaving it unusable for making calls and texts, and though I can read and speak modest French, I was unable to find the cause. There are always issues of prepaid cards for short use. If you put too much in the card, it's wasted unless you are coming back soon. If you don't put enough in, you have to run around buying and adding refills -- again with prompts not in your language. Carriers would do well to let you add a lot to the card, and then refund it to you on request. This would make me put more in the card, and use the phone more, so it's a win for them. As noted, balances usually expire quickly, and cards often expire after 6 months or a year if not used. Though some cards are lasting longer. In some countries, they won't let you refill from a credit card, which means you must buy cards at local shops with cash, and always have a card handy -- then throw away the spare cards when you leave, wasted. You need to learn and give a new phone number to people. You may be able to forward your old number, but often that comes at a high cost. As a plus, you make it much cheaper for locals to call and text you, while making it more expensive for people back home to reach you (unless you forward and eat many times that cost.) You do get the "advantage" that incoming calls and texts are free. Text messages generally do not forward, so you will not see those unless you keep 2 phones -- and pay roaming. Calls back home may or may not be quite expensive, but usually are much less than roaming rates on your home SIM. If you move to a different country, you usually have to do it all over again -- shop again, and have a new number. In Europe, where it is common to hop from country to country this becomes a real issue. Some prepaid plans allow tolerable voice roaming in other countries, though data roaming tends to still be expensive on prepaid, in spite of a European order to reduce it. You are going to pay $10 to $20 plus your time for all this, and if all you want is to do a few voice minutes and some texts and keep your data usage to wifi, you might not come out ahead on a short trip. Car V2V doesn't satisfy these rules. There is no value for the first person to install a V2V radio, and very tiny value for the first thousands of people. An experiment is going on in Ann Arbor with 3,000 vehicles, all belonging to people who work in the same area, and another experiment in Europe will equip several hundred vehicles. Interesting article about a new plan for mesh networking Android phones if the cell network fails. I point this out because of another blog post of mine from 2005 on a related proposal from Klein Gilhousen that he was pushing after Katrina. If you're going to have a meeting with people in a meeting room and one or more people calling in remotely, I recommend trying to have a remote multi-party video call, or at the very least a high-fidelity audio call, and avoid the traditional use of a phone conference bridge to a speakerphone on the meeting room table. The reality is the remote people never feel part of the meeting, and no matter how expensive the speakerphone, the audio just doesn't cut it. There are several tools that can do a multi-party video call, including Oovoo, Sightspeed, Vsee and others, but for now I recommend Skype because it's high quality, cheap, encrypted and already ubiquitous. While you can just set up the meeting room with Skype on a typical laptop, it's worth a bit of extra effort to make things run more smoothly in the meeting room, and to get good audio and video. Here are some steps to take, in rough order of importance. You should upgrade to the latest Skype. Use "Help/Check for upgrades" in Skype or download from their web site. Create or designate a "conference master" account. (Skype no longer needs a Premium account for this but calls are limited to 4 hours/day and 100hrs/month.) I also recommend you have some money in the Skype account for outbound calling, see below. The conference master should learn the UI of multi-party calling. They must be on Windows or a Mac. (Sadly, for now, only Windows is recommended.) The UI is slightly different, annoyingly. Read Skype's instructions for windows or Mac. They also have some how-to videos. The hard reality is that the Windows version is more advanced. Don't learn the UI during the conference -- in particular make sure you know how to deal with late callers or re-adding bounced people because it can happen. The conference master should have a decently high-powered PC, especially if having 4 or more remotes. Notify all participants of the name of the conference master. Have them add the conference master to their contact list in advance of the conference. Confirm them as buddies. Alternately, if you know their Skype names, add them and get them to confirm. Create, in advance, a call group for the conference. You may wish to refer the remote callers to my guide to calling in to a multi-party videoconference or a similar document. Send them the master ID when you mail them instructions like these. The camera is low down on the table, and laptop quality. It often captures backlights and looks up at people. Half the people are blocked from view by other people or stuff on the table. The microphone is at the far end of the table, and it's a cheap laptop mic that picks up sound of its own fan, keyboard and possibly projector. When it sets levels based on the people at that end of the table, it makes the people at the other end hard to hear. You need the sound up loud to hear the remote folks, but then any incoming calls or other computer noises are so loud as to startle people. People haven't tried the interface before, so they fumble and have problems dealing with call setup and adding new callers or returning callers. This frustrates the others in the room, who just want to get on with the meeting. Some folks have to come in by telephone, but you can't really have a speaker phone and a computer conference talking speaker to microphone very well. Having a group videoconference, or participating by video in a group meeting (where several people are in a meeting room, and one or more others are coming in via video) is quite useful. It's much better than the traditional audio conference call on a fancy speakerphone. The audio is much better and the video makes a big difference to how engaged the remote parties are in the meeting. There are many tools, but right now I recommend Skype and Google Hangout which are both free. Hangout does 15 people and Skype 25. You want people using the latest versions. Long ago I described how I want my cell phone to let me command it to play a recording to a caller noting that I have answered but need some time before I can talk, and also how I want the phone to stop ringing once I start fumbling for it. I learned that a few phones do have the former feature in a simple form, and it is something that is within the range of an app in some OSs but not others. We've all experienced it. A cell phone starts ringing or vibrating. To be clever, it slowly starts getting louder in case the owner didn't hear or feel the initial signal. You see somebody going through their bag looking for the phone that keeps getting louder and louder. Finally they answer and it shuts up. Last week, I wrote about issues in providing videoconferencing to the aged. Later, I refined a new interface plan discussed in the comments. I think this would be a very good way for tools like Skype to work, so I am making an independent posting, and will encourage Skype, Google video chat (and others) to follow this approach. While videoconferencing may not make sense for everyday use, I think it has special value for contact with distant relatives, particularly older ones who don't travel very much. They may not get to see the grandchildren, great-grandchildren or even children very often, and their lives are often marked by a particular loneliness, particular at senior homes. But today's videoconferencing tools are getting quite good and will get even better. Skype now offers a 640x480 video call if you have enough bandwidth and CPU, which is not far off broadcast quality if not for the mpeg artifacts they have trying to save bandwidth. It's also pretty easy, as is Google's GMail video chat and several other tools. We're just a couple of years from HDTV level consumer video calling. Video calls also offer extra human bandwidth, which is a big plus with people who are getting infirm, less strong of mind and hard of hearing. Reading lips can help improve how well you are understood, and physical cues can mean a lot. And so I think it's crazy that senior homes, hospitals and hospices don't come standard with a video call station. This is not anything fancy. It's a computer, a webcam, and a megabit of internet. Ideally wireless to move into rooms for the truly infirm. Yet when I have asked for this I have found myself to be the first person to ask, or found that there are policies against internet use by any but the staff. I'm going to describe two paths to getting this. The first uses off-the-shelf hardware and freeware, but does require that the staff of these facilities learn how to use the system and be able to set their residents up in front of it when it is time for a call. This is not particularly difficult, and no different then the staff being trained in any of the other things they do for residents and patients. Then I will discuss how you would design a product aimed for the sector, which could be used without staff help. Today I was pointed to this advertisement asking you to buy prepaid phone cards for the troops. AT&T has set up special phone stations near all major deployments in the Mid-East. Phone access for our troops is easy, but calls home remain expensive. A brunch was planned for my mother's house on Sunday, but being 2,500 miles distant, I decided to try to attend by videoconference. Recently Skype has started supporting what it calls a "high quality" videoconference, which is 640x480 at 24 to 30 frames per second. At its base, that's a very good resolution, slightly better than broadcast TV. This requires fairly modern hardware, which my mother doesn't have. It needs a dual-core processor to be able to compress the video in real time, and a decently fast processor to decompress it. It wants 384K of upstream bandwidth, but ideally even more, which in theory she has but not always. It demands Windows XP. And artificially it demands one of three of Logitech's newest and most expensive webcams, the Orbit AF or the Quickcam Pro for Notebooks or Pro 9000 for desktops. These are the same camera in 3 packages -- I took the Orbit AF which also includes a pan/tilt motor. Skype's decision to only work with these 3 cameras presumably came from a large kickback from Logitech. Admittedly these are very nice webcams. 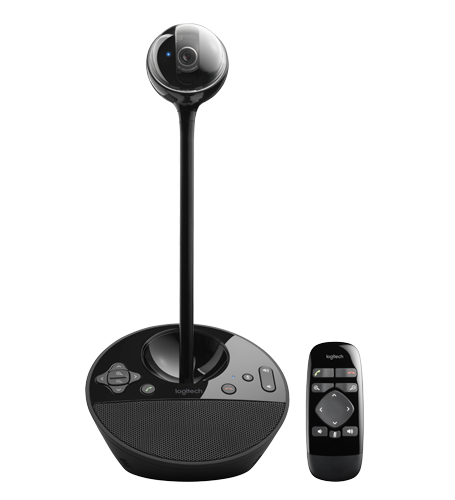 They are true-HD webcams that can native capture at 1600x1200. They are sharp and better in low light than most webcams, and they come with a decent built in microphone that appears as a USB audio device -- also good. But they aren't the only cameras capable of a good 640x480 image, including many of Logitech's older high-end webcams. They retail for $100 or more, but via eBay sellers I got the Orbit AF for about $75 shipped and the Pro for Notebooks shipped quickly within Canada for $63. Some versions of Skype allow you to hack its config file to tell it to do 640x480 with other quality cameras. That is easy enough for me, but I felt it was not something to push on the relatives quite yet. On the Mac it's your only choice. Testing on my own LAN, the image is indeed impressive when bandwidth is no object. It is indeed comparable to broadcast TV. That's 4 times the pixels and twice the framerate of former high-end video calls, and 16 times the pixels of what most people are used to. And the framerate is important for making the call look much more natural than older 10fps level calls. Ok, this would be a cool application for iPhones, Pocket PC and the like -- a dialer which presents an old style rotary phone dial, and you have to put your finger in it and spin it around the center, and then it slowly twists back and plays the sound of a dial returning. A bit like how you control an iPod, but slower. Completely useless, other than for having fun and explaining to kids why we call it "dialing" a phone.